I saw the new documentary film Fed Up and was both outraged and saddened. Simply put, food companies are killing us and this assault is facilitated by our own government. This may sound like hyperbole, but go see the film and decide for yourself. In the same fashion that corporations have been allowed to market and sell cancer causing cigarettes, resulting in countless early deaths, corporations are allowed to sell food that is known to be unhealthy. Fed Up describes how food companies add copious amounts of addictive sugar to our food simply to make money—at the expense of our nation’s health. To make matters worse, corporations are aggressively marketing these unhealthy foods to children. They are allowed to serve, sugar laden, processed, fast foods in our children’s school cafeterias. Today the vast majority of schools simply don’t cook anymore. In low income Black communities, our children not obtaining adequate educations, and they are also subjected to food that is causing them to become overweight and sick. Who knows what impact this food has on our children’s ability to learn? None of Michelle Obama’s Let’s Move! initiatives address the real problem: Corporations are allowed to generate enormous profits by creating super-sugary products and making it appear that these foods are actually good for you. Obama’s initiatives call for more exercise and smart food choices. Of course both of these are great ideas, but this is shifting the blame to the victim and ignoring the root cause which is not a solution. There is simply not enough time in the day to work off all the extra calories from the sugar added to our diets. Laziness and low self-esteem is not why people are fat; it is the food supply. Laziness and low self-esteem are the result of a poisonous food system, not the cause. As anyone my age (50’s) knows, obesity on this scale is a relatively new problem. When I was younger, you could count on one hand the number of obese children in a given grade. Today, in many communities, 30% or more of the children are obese. Many tens of thousands of children in the United States suffer from type-2 diabetes. Type-2 diabetes in a child was unheard of until recently. It used to be called “Adult-Onset Diabetes.” Many in our community, unable to achieve a healthy weight, have embraced the new normal, accepting the condition. This is tragic. Did you ever wonder, or even notice that, that the recommended daily allowance for sugar is left off of the food package’s, euphemistically labelled, “Nutrition Facts.” On the Honey Nut Cheerios cereal box (from my kitchen cabinet) we can see a serving contains 9 grams of sugar. Nine grams is almost 40% of the 24 grams per day maximum recommended for a grown woman. A serving of cereal is described as 3/4 of a cup. Realistically, this is less than half of what an adult would likely eat for breakfast. Throw in a 8 ounce serving of orange juice (an amount less than most of us drink as a serving) for an additional 25 grams of sugar, and we can see how this very modest, seemingly healthy breakfast, consisting of an 8 ounce glass of orange juice (25g), ¼ cup of cereal (9g), and 1/4 cup of 2% milk (2g) quickly adds up to a whopping 36 grams of sugar. This 150% more than the daily recommended amount for a woman and 100% for a man. One in five Black children ages 2 to 19 is obese, compared with approximately one in seven white children. 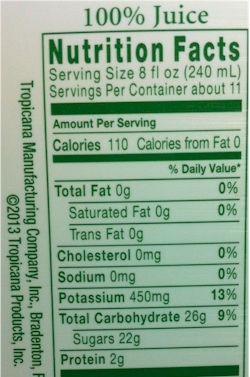 A 20-ounce bottle of soda contains the equivalent of approximately 17 teaspoons of sugar. It will take a 110-pound child 75 minutes of bike riding to burn off the calories in one 20-ounce bottle of soda. Kids watch an average of 4,000 food-related ads every year (10/day). 98% of food related ads that children view (3920/year) are for products high in fat, sugar, sodium. 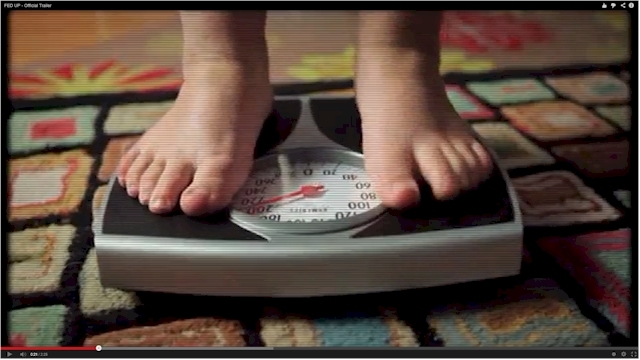 Almost 45 percent of overweight or obese children ages 10 to 17 are poor. Few in the Black have much faith in the government’s ability, or rather willingness, to protect us. But this is not just a problem for Black America, this is an American problem and the solutions will have to come from us. The first step is education. Please share this information and visit the Fed Up movie website to learn more. While looking for more information about this subject I noticed an advertisement on Google’s website called “FedUpFacts.” The site, whose homepage looks very much like the Fed Up movie site, is produced by the Grocery Manufacturers Association (GMA). The GMA represents the self-proclaimed “makers of the world’s favorite food, beverage and consumer products.” On the FedUpFacts website you will find additional “facts,” all of which contradict the information provided in the film. Sources cited included a February 2014 New York Times’ article, Obesity Rate for Young Children Plummets 43% in a Decade. One thing that was not disputed by the Grocery Manufacturers Association is the fact that the sugar added to our food is making people obese and unhealthy. Does a 20oz soda, with 54 grams of sugar (almost a 1/3 of a cup!) need to be aggressively marketed to children? ← Marcus Books of San Francisco Evicted—Should We Care?